The bottles above were both recovered from an old barn in New England. They started out looking the same, but the one on the right was exposed to gamma rays. It’s amazing to think about this process. Gamma rays are just high energy photons – tiny particles of light. 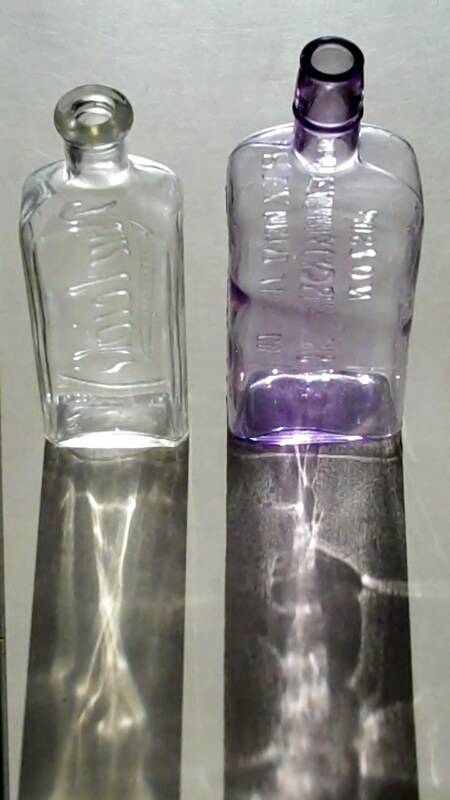 When they interact with the glass molecules they change the structure of the glass and give it a nice lavender color. But it’s not just one or two photons it’s trillions and trillions of photons, each making their indelible mark in the glass. The process is invisible, but the results are permanent and they reach far beyond the surface of the bottle. This reminds me of motherhood. The process of being a mother is incredible – it’s a slow and thankless job. I know that the hours are long and the pay is nonexistent, but as the son of a wonderful mother and the recipient of her boundless love I know what the effects are. Her love, her example, and her endless prayers have permeated every aspect of my life and changed me for the better. The faults I have (and the list is long) are my own, but all that is good and beautiful within me I owe to my mother. So to my wonderful mother – thank you. To my lovely wife, the mother of my children – thank you. And to all of you mothers out there, whether you have children of your own or mother the children around you – thank you. We may only celebrate Mother’s Day once a year, but my gratitude is constant and eternal. Mike,thank you for such a wonderful Mother’s Day gift. This post meant more to me than anything you could have given me. I, too, have many imperfections that have caused you pain during you life. But I am also full of the joy and love that entered me life the moment I conceived you. I love you for the rest of eternity.